As Chevrolet launches the Trax in the United States, we’ve gather some fairly interesting facts about the brand’s smallest crossover. Here we go. We first drove the 2015 Chevrolet Trax in April, but as a Canadian-spec model. While the B-segment crossover is still very much the same, Chevrolet engineers managed to fine-tune the 2015 Trax for its United States debut. In doing so, it becomes the quietest Trax available for sale in the world thanks to some pull-down features from its cousin, the Buick Encore. The front windshield, front stationary glass and front 3/4 glass are all laminated, and the dashmat material is more dense than the global vehicle — all of which leads to enhanced sound deadening, and a more hushed ride. As for the Canadian-spec Trax, Chevrolet plans to upgrade it with the same fitments as soon as possible. With current U.S. entrants such as the Kia Soul, Nissan Juke, Mini Cooper Countryman, and Mitsubishi Outlander Sport, one might say the 2015 Chevrolet Trax is showing up as the party is getting crowded. But better late than never, as the small crossover segment is booming, with automakers everywhere scrambling to offer vehicles in it. Market volume for the segment is expected to hit 2 million annual sales very soon, and from a business standpoint, that’s all GM needed to finally pull the trigger on launching the Trax in the USA. Why the delay? Some will say that the Chevrolet Equinox has been too golden of a goose, and the lower-profit Trax posed a sales-robbing risk. But the mid-size Equinox is running towards the end of its product life-cycle for the current generation, and The Bowtie still needs a fresh entrant in the face of its rivals, especially before the Jeep Renegade, Honda HR-V, Fiat 500X and other subcompact crossovers inevitably enter the fray. Fun fact: the first market to receive the Chevrolet Trax was Mexico. The Trax is also built in Mexico, but the U.S.-spec 2015 Trax is built in Korea as well. In a focused attempt to target a new age of buyer (read: Millennial), Chevrolet has dismissed traditional television advertising in favor of the digital medium. That makes sense, as Millennials fixate their attention on more mobile shining rectangles that play music and videos that distract them from the mounting tribulations of the world around us. Nothing is entirely set in stone yet, but look for marketing campaigns to take place on such online music streaming services as Pandora, Spotify, and iTunes Radio, as well as the ever-popular Buzzfeed and websites like it. May yours truly suggest the website Thrillist as well, Chevrolet. For the frugal-minded urban adventurer that Chevrolet is targeting, fuel economy could be a big consideration. Specifically, the 2015 Chevrolet Trax in FWD configuration posts an EPA-rated 26 mpg city, 34 mpg highway and 29 mpg combined thanks to the ubiquitous 1.4-liter turbocharged EcoTec LUJ/LUV engine making 138 horsepower and 148 pound-feet of torque mated to a six-speed automatic transmission. That’s as good as it gets in this small segment (literally and figuratively), as the only other vehicle to match those numbers is the 2015 Subaru XV Crosstrek, while the Nissan Juke shares the same combined rating. Checking the all-wheel-drive box when configuring a vehicle tends to increase the MSRP quite a bit, but Chevrolet has minimized the sticker shock in the case of the 2015 Trax. That’s because AWD is just a $1,500 option — the most affordable AWD option in Chevrolet’s portfolio. Anybody who lives in the snow states will likely appreciate this. 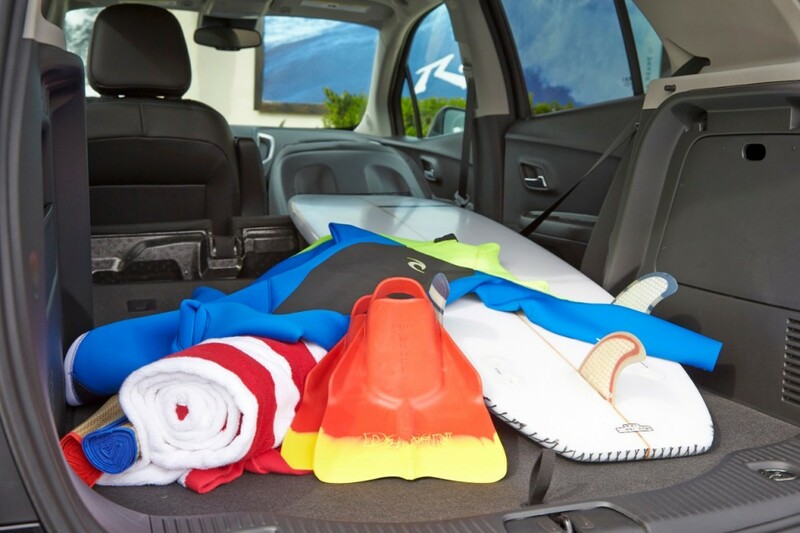 A six-foot surf board is no match for the cabin of the 2015 Chevrolet Trax, which features 48.4 cubic-feet of space (18.7 cu-ft of it is behind the rear seats). Thanks to a 60/40 split rear seat, and a slight fold of the front passenger seat, the surf board fits right in with some room to spare, as seen above. Your friend would just have to sit behind you, however. Nobody dislikes an affordable means of transportation, no matter how old they are. And unlike the lively styling of the Nissan Juke and Kia Soul, which can turn some buyers off, the 2015 Trax carries a more subdued face, yet remains distinctly Chevrolet. The appeal also echoes that of the Buick Encore, which targets both young professionals under 35 with either no kids or toddlers, along with empty nesters who no longer need the (larger) family SUV. If there was one complaint, it’s the infotainment system. The lack of buttons makes even selecting a radio station more tedious (and distracting) than it should be. I don’t want to imagine my parents trying to figure the system out. But hey, it looks nice, so… there’s that. Meanwhile, Siri Eyes Free lets drivers place calls, compose or hear text messages, and select music through voice command via select iPhones. There will be roof racks, there will be bike racks, and hopefully more to come as Chevrolet targets the active urban explorer and weekend adventurer. 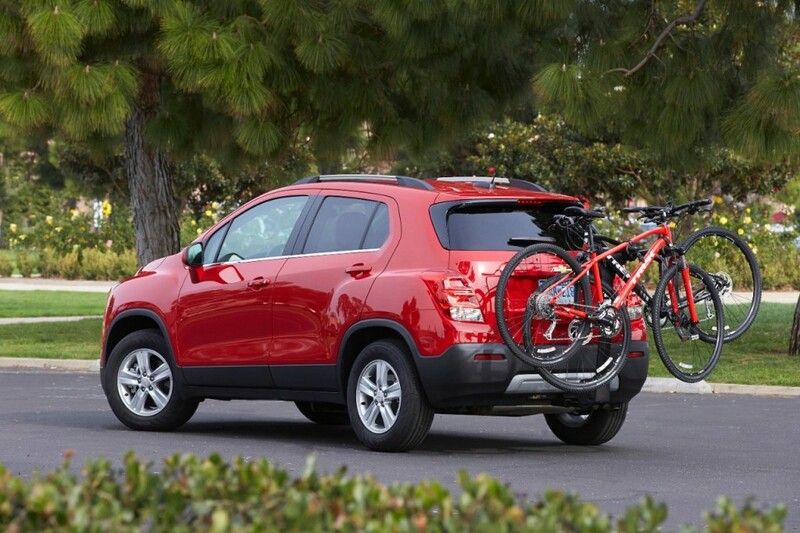 For example, the Buick Encore currently offers a luggage carrier, kayak carrier, ski carrier and roof-mounted bicycle mount as well as a hitch-mounted bike rack as accessories. The Trax’s European relative, the Opel Mokka, offers eleven types of Thule roof boxes. Though if Chevrolet wants to take a bite out of Subaru’s active lifestyle crowd they would have to, have to, emphasize these accessories in their marketing campaigns, and not just when shoppers walk into dealerships. The 2015 Chevrolet Trax comes standard with OnStar 4G LTE with Wi-Fi on any trim level. The feature is a segment first, and considering the target market, is a pretty big deal. Carpoolers, parents, or the sorry Verizon user who doesn’t want to waste their data streaming Pandora via Bluetooth will certainly appreciate this. I like this one over the HR-V since HR-V already looks boring. This has only one glaring omission IMO: proper instrumentation. Get rid of the current set up and put a real speedometer in it. Otherwise though, I’m sold. I’ll add two thoughts. First, Buick dealers are probably unhappy. Second, GM needs to add a decent powertrain to this vehicle, yesterday. Would be nice to see a dashboard upgrade that gives it the standard Global A dash. Yes, I know Encore has this. But I have high disdain for the Gamma II-forked “motorcycle inspired” dash. It may save ~$100 per car, I’d gladly pay $500 to be gone with it. Point 8 is pretty spot on. Upgrade the suspension, drop a 2.0T Ecotec in there, and you have not just an HHR SS successor, but a GTI killer. The Buick sales were a pleasant surprise but I have a feeling things here may be a little tougher. Price is going to be key with the Chevy as there is a lot of established competition in this segment. There is also a new Nox coming and Let hope GM forgets a GMC clone here unless they re body it to the point you can not see the Gamma II heritage. As I see it the dash is the least of the issues here. But on the positive there is little risk as with it selling in so many markets if things go slow here they will pick up with the other markets. I think the Trax will be a hot vehicle in metropolitan areas . Small , decent price and it is kind of cool looking . The Encore sells to a complteley differnet demographic , so Buick shouldn’t be worried about loosing sales to the Trax . If GMC jumps in I don’t see it as feasible . Rumors are the next Gen Terrain will be smaller than the current model , and the Encore will also be smaller . I just don’t see ” Professional Grade ” in building one . Unless of course if it looks like the concept I’ve seen ( can’t remember the name ) . They’re making a mistake ignoring traditional media channels. Its rote arrogance to position this vehicle ad wise in millennial exclusive channels, because you know who is going to love this vehicle, Grandma, or the empty nesters who have in fact heard about the HR-V or the CX-3 or the Renegade from mainstream channels. I agree! The imports put up plenty of ads for their vehicles, since the majority of car buyers do watch TV and read ads in papers and magazines. Please put new ads for the Trax and for all the Chevy models, including the Volt! Trax will have some tough competition from Honda and Mazda. They are especially better on the interior, with higher quality soft touch surfaces. And Honda gets a center arm rest as well. GM will need an interior upgrade and the 1.6 T as an option to fend off the challenge of its new rivals. These two upgrades will keep it a top competitor. This should do fairly well as it seems the price and fuel economy are competitive, and throw in the LTE which is important to many people. But, to help it over time, it will need the 1.6T as an option. Will they offer these in hetero, too?